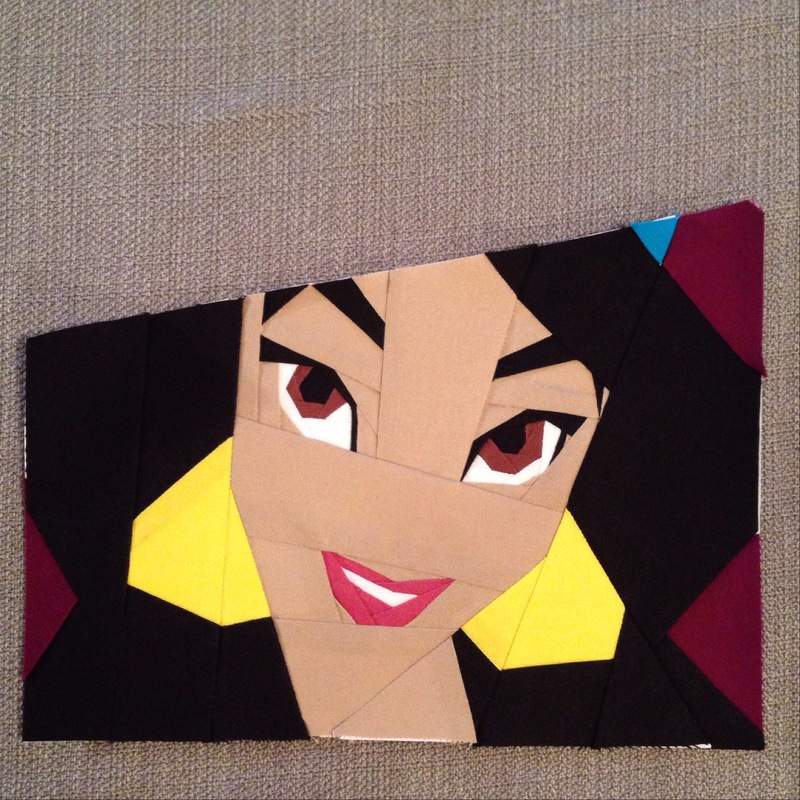 This month’s birthday girl is a HUGE Disney fan, so I thought a Disney mini quilt would be perfect. 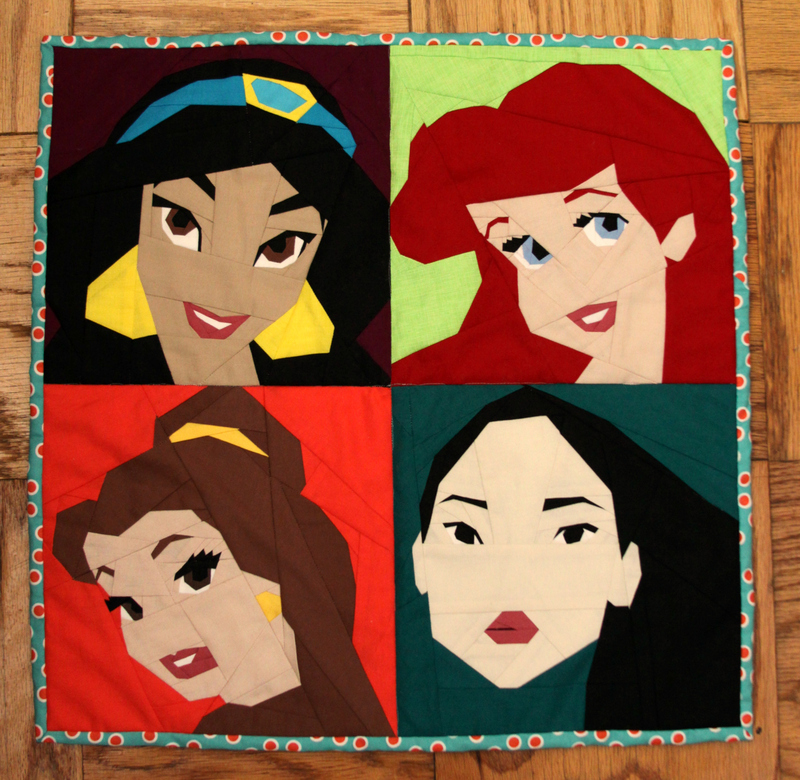 I included my three favorite princesses (Ariel, Jasmine, and Belle – in descending order), plus Pocahontas. I can’t say Pocahontas is my favorite movie, but I’ve enjoyed the music since playing it as part of my middle school orchestra. Hope the birthday girl likes it! You can see other birthday gifts our swap group has made on Instagram with the hashtag #birthdayclubhandmade. We sew a gift and provide a few extra goodies for each person’s birthday, once a month or less. 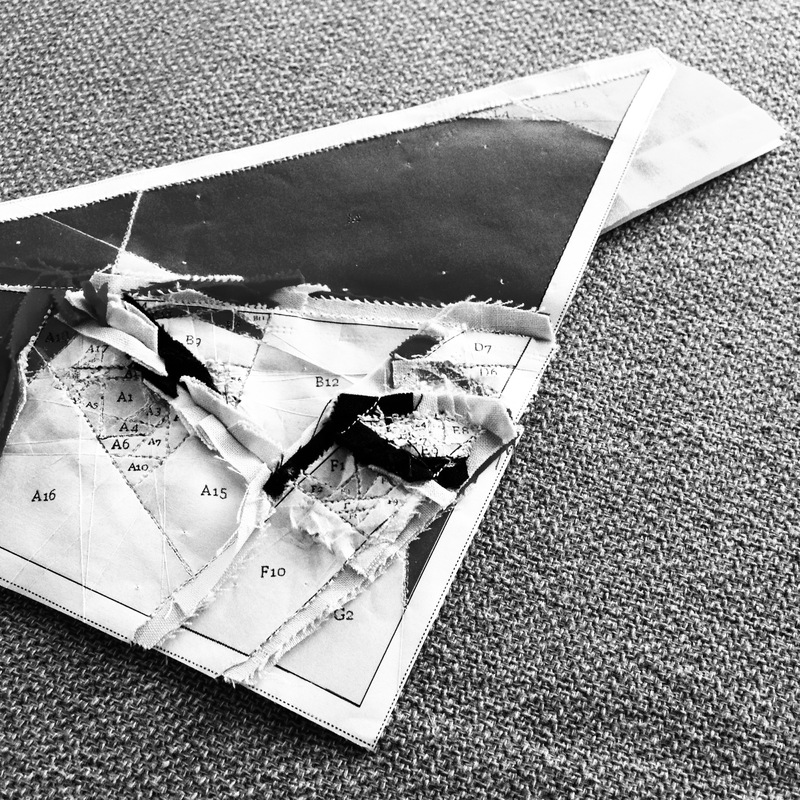 One of our birthday club members has left the group. If you have a spring birthday (February to May) and would like more info about what it would mean to join the group, I would love for you to email me at dakotapatchwork at gmail dot com. 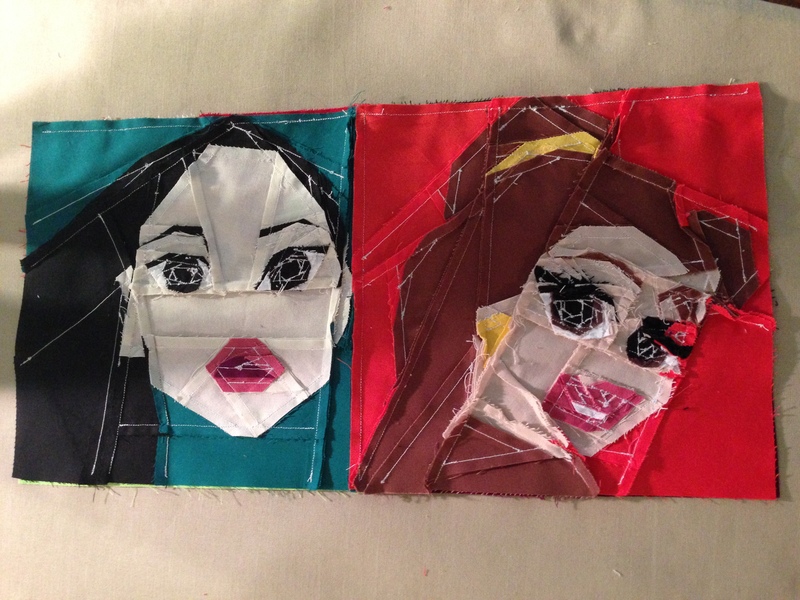 Maybe because Halloween is this month, I think the back side looks like Disney princesses with zombie makeup! Free (!!!) Disney princess patterns are by Michelle Thompson and are available on both her website and on Fandom Stitches. She was even kind enough to fix the Jasmine link and email me when I asked! I normally wouldn’t point out mistakes, but I did make a few in the mini above and want to be clear that they are my own and not part of Michelle’s awesome patterns. 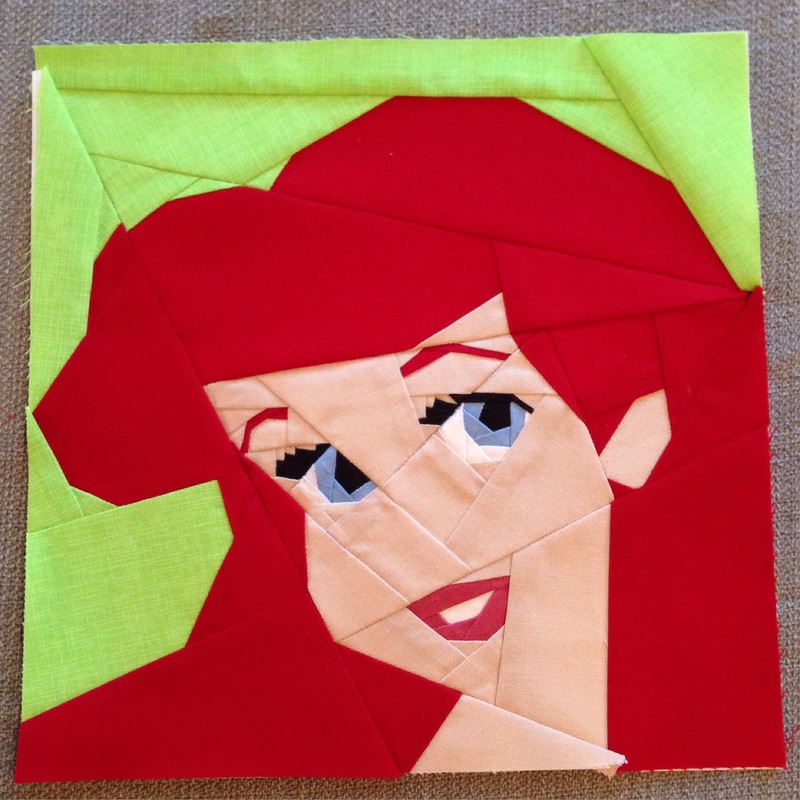 Categories: Quilts | Tags: ariel, belle, birthday, birthday club, birthday gift, birthdayclubhandmade, disney, disney mini, disney paper piecing pattern, disney princess, disney princesses, free, free disney pattern, free disney quilt block, free disney template, free paper piecing pattern, handmade birthday club, handmade birthday gift, instagram, jasmine, michelle thompson, mini, mini quilt, misha29, paper piecing, pocahontas, quilt, quilt mini, quilting | Permalink. This is great! We have a granddaughter who would love this. Listening to the Frozen song was inspired, too. I will check out the web-site. I’m really loving all the free Disney patterns online right now. If you have an Instagram account, you might also watch through December and the New Year for posts about a Disney swap. I’m not signed up myself but expect to see lots of fun projects! Hopefully, people will blog about their projects, too.